George Wagner was born April 3, 1871 in the colony of Brunnental, Russia, the son of Johannes Wagner and Katharina Batt who were early pioneers in Portland. George married Katherine Huber about 1891. Katherine, the daughter of John Huber, was born September 28, 1870. George and Katherine immigrated to the United States on March 20, 1899 arriving in New York on April 5, 1899 aboard the steamship Graf Waldersee along with his father and step-mother, who had briefly returned to Russia. George was naturalized in Ritzville, Washington where he first settled before migrating to Portland. George owned and operated a Jitney bus for several years. 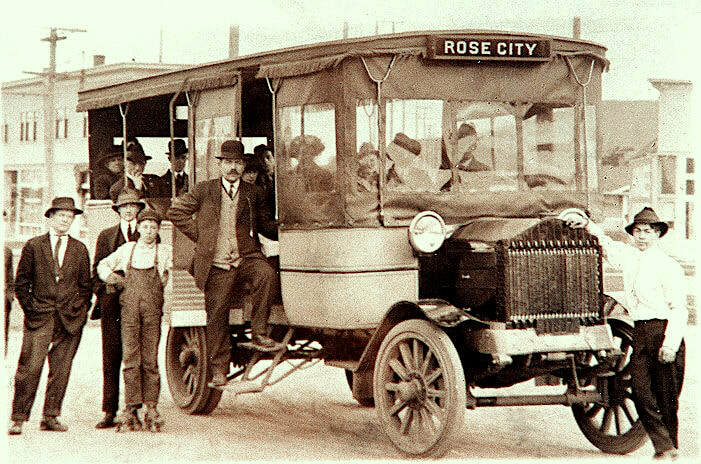 Jitney bus owned and operated by George Wagner. Courtesy of Sherrie Gettman Stahl. George and his brother John, purchased the New Haven Carriage & Auto Works around 1912. George later sold his interest in the company to John. George later owned the Wagner Auto Wheel Works. John H. ("Jack") was born January 31, 1893 in Brunnental. Jack became a standout professional boxer and manager. Jacob H. ("Jack") was born April 28, 1895 in Brunnental. Jack was a auto mechanic, President of the Oregon Truckmen's Association and served in the Oregon State Legislature. Anna Elisabeth was born January 31, 1899 in Brunnental. Henry W. was born October 4, 1900 in Oregon and owned a successful radio and television business. Carl was born February 10, 1902 in Portland. George Jr. was born June 12, 1903 in Portland. Mary was born November 8, 1904 in Portland and died in 1909. Emil E. was born Ocober 14, 1907 in Portland. The 1910 US Census shows the family living at 695 Holladay Avenue (695 Oregon). 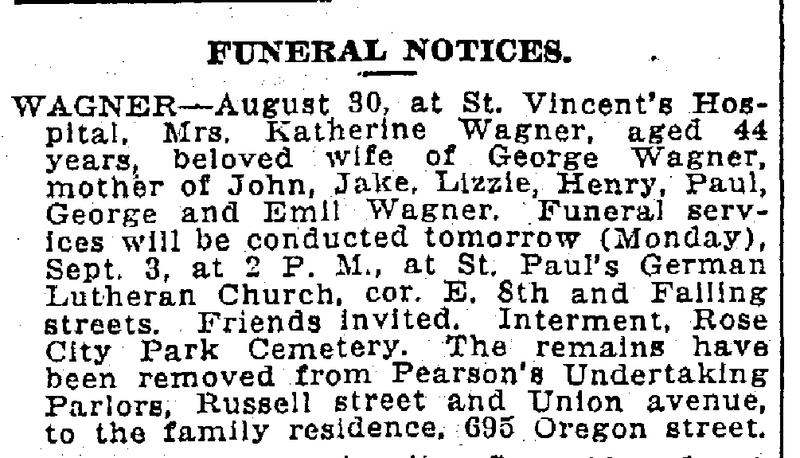 Katherine died on August 30, 1917 in Portland and George then married his second wife, Christine M. Brehm in 1918. Marie Wagner was born on July 30, 1919. George died on June 12, 1935 in Portland and was buried June 16, 1935 at the Rose City Cemetery. The 1920 US Census shows the family living still living at 695 Oregon Street, Portland, Oregon. George's father, John (age 84) is living at the same address.